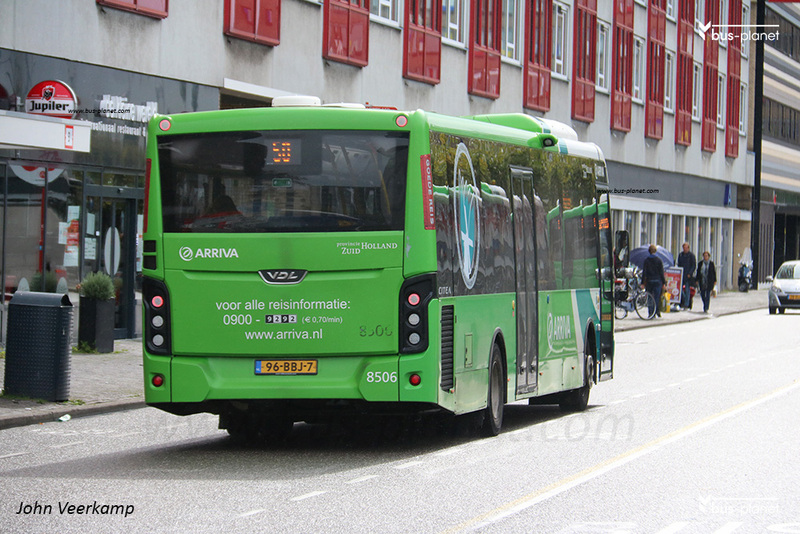 In December 2012 Arriva won the concession NW Friesland and Zuid-Holland Noord. Both concessions received the same basic fleet of VDL Citea LL120, though in different color schemes. The ZHN buses were on time for the start of the concession in December 2012, the Friesland buses were one or two months late. As it turned out Friesland had a few too many buses and ZHN lacked some. Friesland 8538 and 8539 were immediately transferred to ZHN in February 2013, received the ZHN livery and stayed. In Jnauary or February 2014 another vehicle, 8506, underwent the same fate. In March 2017 similar 8515-8517 went to ZHN but only 8516 received ZHN colors and stayed. 8515 and 8517 were used on the Keukenhof routes with dedicated wrapping and returned to Friesland upon closure of Keukenhof in June 2017. Picture(s) taken by John Veerkamp. Netherlands. Leiden. dd: 2017-09-16.